One of the many reasons people learn to dive is so they can observe and interact with underwater life. How you interact with animals under the sea can significantly alter your appreciation for the marine environment?and your risk of injury. Regardless of your technique or diving preferences, there is always the risk that you will be stung, bitten or cut by an aquatic animal. For example, a dive student on her first trip to Cozumel thought that stingrays were the Caribbean?s equivalent of the New England skates she remembered?until she was stung when playing with one. She ended up experiencing a great deal of pain and had a scar to boot. The lesson she learned is not to touch anything that she didn?t know. Injuries caused by marine animals are extremely rare and are most often the result of a diver?s carelessness or an unwitting intrusion into the animal?s territory. A diver may accidentally brush against fire coral, or an animal may react in self-defense because it feels threatened. Either way, most marine animal injuries are not life-threatening and cause only minor discomfort and embarrassment. However, learning how to identify and to avoid hazardous marine life is valuable knowledge for any traveling diver. Plus, knowing how to provide first aid for marine life injuries can make a significant difference in your dive experiences and those of your diving companions. Marine creatures are responsible for four primary categories of injuries: envenomations, attacks, irritations, and poisonings. Marine animals that sting are the greatest threat to divers. From jellyfish to venomous fish such as scorpionfish, stonefish, stingrays, lionfish (and many more), these animals can cause painful injuries. 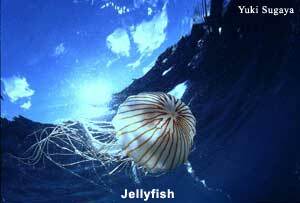 When diving in a current, or when using an ascent/descent line, a diver can accidentally brush against a jellyfish: this stimulus causes the animal to react. It discharges nematocysts, or stinging cells, which can result in a painful injury for the diver. Jellyfish normally use these stinging cells to immobilize prey, but they can discharge when affected by a stimulus such as the touch of a diver?s hand. Once discharged, the nematocysts penetrate the skin and inject venom. The severity of the resulting injury depends upon a number of factors, including the type of jellyfish, the potency of the venom and the amount of venom injected. Individual reactions vary and can be affected by the health of the diver and individual sensitivity to the venom or other potential allergic reactions. The reaction to the stinging cells varies greatly?an injury can result in anything as mild as moderate itching all the way to respiratory and cardiac arrest. Other signs and symptoms include redness around the wound, welts, stinging, burning, swelling, blisters, anxiety and shock. While at least 100 types of jellyfish can harm divers, a few species deserve special recognition. The box jellyfish, or sea wasp (Chironex fleckeri), irukandji (Caukia barnesi) and the Portuguese Man-O-War (Physalia physalis) can cause excruciating pain to unsuspecting divers. Of these, a sting from the box jellyfish, found in the waters off Queensland, Australia, is lethal, capable of causing death in under a minute. Any diver who is stung by the box jellyfish should receive the antivenin as quickly as possible. The pressure immobilization technique, a method of wrapping and immobilizing a wound, helps delay the absorption of venom from a bite or sting into the body?s general circulation (see diagram) and may be useful in slowing down the venom?s progress. First Things First If a diver is stung, assess the situation and provide first aid. When you?re providing first aid for jellyfish stings, first ensure the Airway, Breathing and Circulation (ABCs) for the injured diver. If it?s needed, provide rescue breaths and cardiopulmonary resuscitation (CPR). Neutralize In order to neutralize the nematocysts, pour a liberal amount of acetic acid 5 percent (white vinegar) over the injured area: this prevents further injury to the diver and reduces the risk to the rescuer of being stung while providing first aid. Don Protection As the rescuer, be sure to wear protective medical gloves to avoid disease transmission and possible injury from any remaining nematocysts. If vinegar is unavailable, irrigate with seawater or saline solution. Clean the Wound Once the stinging cells have been neutralized, you can remove any remaining tentacles with forceps or tweezers. You can also shave the area with shaving cream and a safety razor. Apply hydrocortisone cream or lotion and monitor for allergic reaction and/or infection. If the diver experiences pain, apply ice or an ice pack to the area. 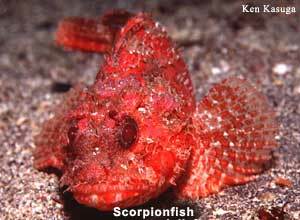 For venomous fish such as scorpionfish, stingrays, lionfish and stonefish, the mechanism of injury is typically a defensive reaction by the animal, caused in part by accidental contact with the diver. Injuries like this can occur in a number of ways when divers (or swimmers or snorkelers) walk across a shallow reef structure or when they first enter the water. They may experience poor buoyancy control while underwater and come into inadvertent contact with a creature by stepping on it, brushing against it or running right into it. Divers can also be injured when trying to handle or feed these fish. Signs and symptoms of spine puncture injuries include immediate pain, puncture or laceration, purple or black skin coloration, bleeding, nausea, vomiting, swelling, shock, respiratory arrest and cardiac arrest. Clean the Wound While it is generally not recommended that you remove impaled objects when providing first aid, you should, however, remove any visible pieces of the spine with forceps or tweezers. Neutralize Rinse the wound with freshwater or saline solution. To deactivate the venom, the wound should be immersed in hot water (113?F/45?C maximum) between 30 and 90 minutes. Get Help Seek evaluation by a healthcare professional, and in the meantime, monitor the diver for allergic reaction and check the wound for infection. If the injury is caused by a stonefish, you will require antivenin. Pressure Immobilization Technique As for treating wounds by these creatures, while the basic first aid procedure is the same as described above, you may require other first aid techniques such as the pressure immobilization technique (see diagram). This helps delay the absorption of venom from a bite or sting into the body?s general circulation. Pressure and immobilization may be beneficial for bites from the blue-ringed octopus and sea snakes as well as box jellyfish stings. Other Venomous Creatures Additional venomous marine creatures to view without touching include the blue-ringed octopus, cone shells, and sea snakes, among others. It?s a good idea to check with local dive guides when diving in new or unfamiliar locations, so you can know what to look for. Being attacked underwater by a shark or eel is one of the greatest perceived fears in divers. These injuries are extremely rare, however, and generally occur as a result of the animal misidentifying the diver as prey or as a threat, or because of a defensive or territorial reaction by the animal. Because of the terrifying aspects of attacks, divers (and the media) tend to overestimate their probability. The types of potential attacks include those by sharks, moray eels, barracudas, sea lions, seals, octopuses and some small fish. Although an attack or bite can be frightening, most injuries are not life-threatening and require only basic first aid. The first concern after being bitten is to prevent further injury and to get out of the water. Signs and symptoms of attacks include pain, bleeding, debris in the wound (such as teeth), bite patterns and shock. First Measures Ensure the Airway, Breathing and Circulation (ABCs) when a diver is bitten. Don Protection Make sure that you wear personal protective equipment such as medical gloves when assisting someone who is bleeding. Control Bleeding Control the bleeding, dress and bandage the wound. To control bleeding, apply a dry, sterile dressing over the wound and apply direct pressure. If the wound is on an extremity such as the leg or arm, elevate the extremity. If the bleeding continues, check for proper positioning of the dressing, apply additional dressings over the wound and increase direct pressure. Avoid removing any of the dressings until the bleeding has stopped. If you are still unable to control bleeding, apply pressure to the arterial pressure point of the limb for up to 60 seconds and slowly release the pressure. This helps the blood to clot at the wound. Once the bleeding has stopped, bandage the wound firmly, but loosely enough to ensure circulation to the extremity. Probably the most common marine animal injury is the coral cut. Many divers forget that coral is a living animal and treat it similarly to rocks?that is, they don?t give it a second thought. Although it seems that these cuts are minor, they are easily infected. Clean the Wound It?s important to clean coral wounds thoroughly. Scrub and irrigate the wound thoroughly with fresh water or a saline solution. Remove any visible debris. Bandage & Monitor Cover with a sterile dressing and then bandage. Be sure to monitor the wound for signs of infection such as swelling, redness, foul smell, fever, pus and swollen glands. You may also apply an antiseptic cream such as bacitracin to the wound. Other Irritants Other animals that cause minor irritations include soapfish, sea sponges and sea bather?s eruption. In addition to the first aid procedures above, applying hydrocortisone cream in lieu of antiseptic lotion is recommended. These animal injuries are more of an inconvenience for the diver than anything else, but knowing how to care for these injuries will provide much-needed relief. Divers must also be concerned with eating seafood when they?re traveling. Many marine animals can be toxic: poisoning from eating your favorite seafood is not uncommon. A primary concern for the diver is that the signs and symptoms from seafood poisoning can be similar to decompression illness (DCI). It is critical that divers who develop unexplained symptoms or illness be evaluated by a medical professional for an accurate diagnosis. Seafood poisoning that divers should be primarily concerned with includes scrombroid and ciguatera poisonings. Other, less serious types of poisoning can occur. Signs and symptoms of poisoning vary with the poison or toxin and include allergic reaction, diarrhea, headache, vomiting, nausea, dizziness, abdominal cramping and burning, chills, fever, paralysis, muscle and joint aches, tingling around mouth and lips and reversal of perception of hot and cold sensations. Check the ABCS The first aid procedures for seafood poisoning consist of assuring the Airway, Breathing and Circulation (ABCs) of the injured diver and, if necessary, providing CPR. Monitor for Allergic Reactions Additionally, any allergic reaction must be managed. If the diver is responsive, you may induce vomiting. Be sure to save the fish or vomitus for analysis by a medical professional. While hazardous marine life injuries range from being uncomfortable to life-threatening, most injuries occur accidentally. For example, a diver with poor buoyancy control may accidentally drop onto a stonefish, or a fatigued diver may inadvertently grab fire coral to stabilize himself in the water. If the animal reacts in an aggressive manner, it?s likely due to a defensive reaction from a perceived threat posed by the diver. Stepping on a stingray while putting your fins on in shallow water may cause the fish to sting you in order to get away from the threat you pose. Did the ray set out to sting you? Of course not. Like all animals, however, it does have a defense mechanism it uses when threatened. Although hazardous marine life injuries are rare, you can minimize your risk of illness or injury by following standard safe diving practices and by being responsible. Diving provides many opportunities to observe and interact with the creatures of the sea. Most of these encounters are truly memorable. Learning how to identify hazardous marine life and avoid hazardous marine life injuries is important for divers interested in improving their diving safety. Learning how to provide first aid for hazardous marine life injuries can help reduce your own discomfort on a diving trip, your buddy?s or that of a traveling companion. Test Your Hazardous Marine Life I.Q. Scuba diving requires professional training and certification. For info, visit our sister site www.scuba.com/learn2scuba.